Step-by-step guides to creating individual resumes and cover letters that reflect your career level and experience. Get guidelines and suggestions from this professional resume maker software about creating resumes of the following types: chronological, functional, combined, or targeted. A great collection of templates, sample cover letters, and other career-related letters for your job search correspondence. The samples show the powerful flexibility in the formats, layouts, and designs available with Easy Resume Creator Pro. Do not limit yourself to the ideas in these samples. Rather, use them as a guide to writing resumes that show you at your best! A list of action words that guide you in listing your accomplishments and skills on your resume. Use action words to describe your accomplishments, the positive results you have achieved, and how effectively you handle different situations. High-speed spellchecking for resume sections and cover letter editor with auto-correction of common mistakes. Add your own corrections to the auto-correction feature as you type. 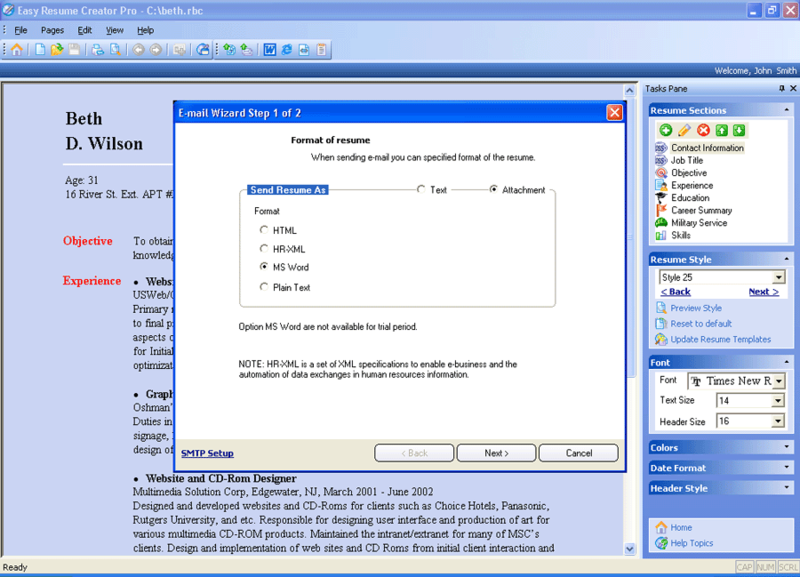 Quickly choose correction for the underlined misspelled words with only two mouse click. 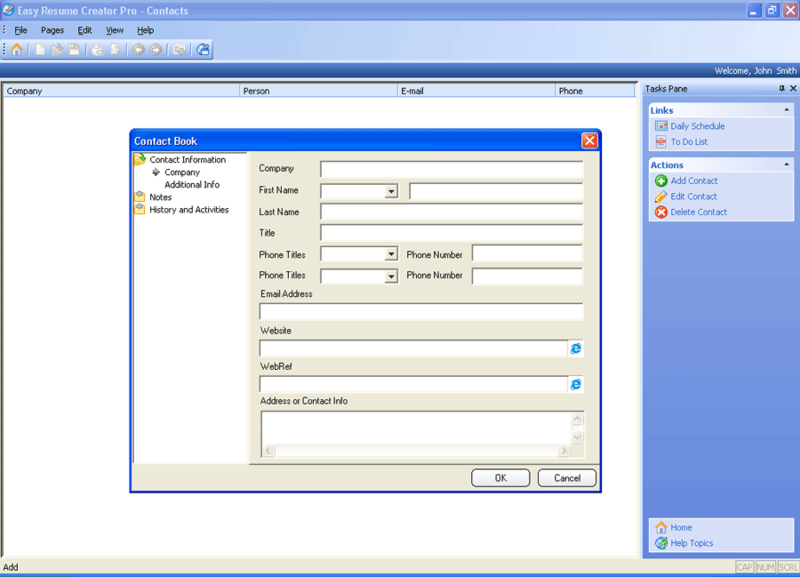 Integrated FTP publishing wizard. This wizard provides an excellent solution for Web publishers or anyone who transmits their resumes over the Internet. Tools that make job hunting easy. 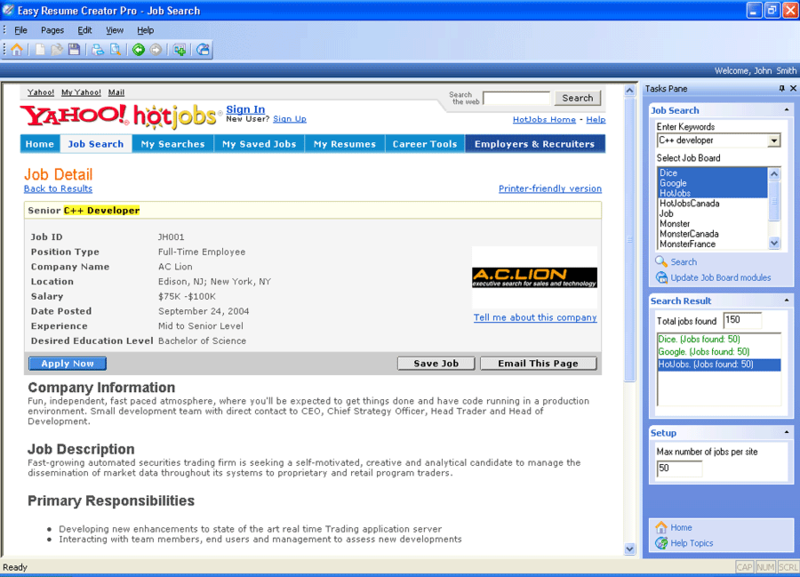 Easy Resume Creator Pro searches for available job openings throughout numerous job boards. Search by a keyword, location, career field and other criterions, and instantly save the results of your searches using the built-in Contact Organizer and E-Mail Client. Features for the most popular word processor formats. 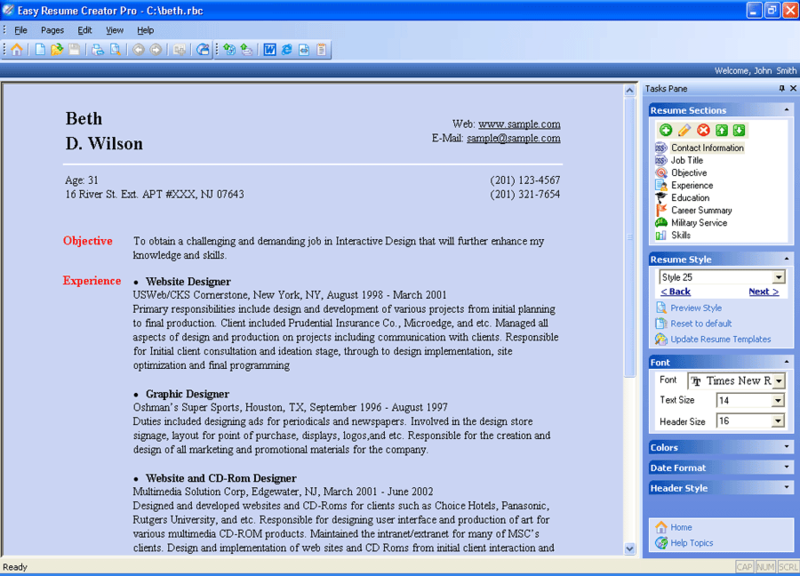 Easy Resume Creator Pro builds resumes in the Microsoft Word, HTML, and ASCII. The software even saves resumes in HR-XML, the special recruitment and employment oriented format. Easy-to-use features! 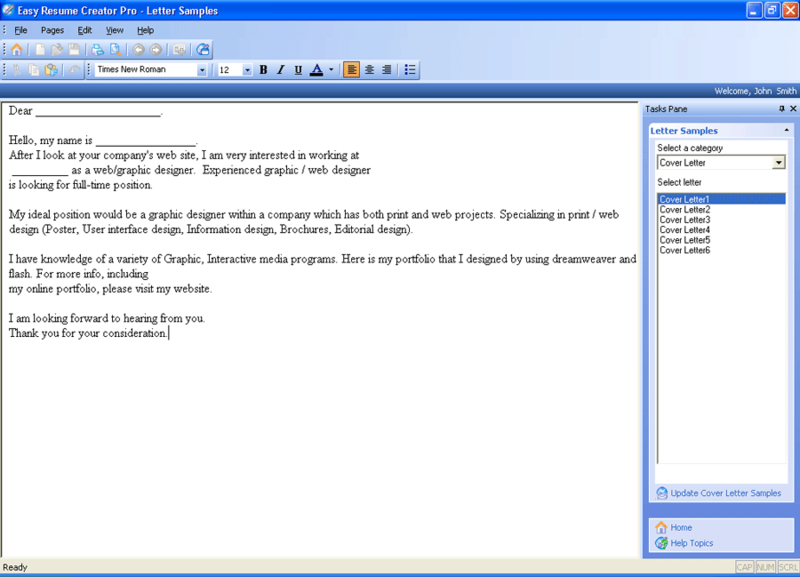 Most of the actions within Easy Resume Creator Pro require only one mouse click. Step-by-step wizards guide you throughout the program. Miscellaneous career-related resources, which include federal employment forms and information, job boards and other useful links. A feature that organizes your prospective employers' contact information, your to-do list, and personal calendar. Track where you have sent your resume, networking contacts, and when you are going to follow up. A feature that allows more than one person to work with the program. To keep each person's individual settings and personal information safe, Easy Resume Creator Pro maintains the users' profiles. Links and resources that are updated with every new version of the software, free of charge. 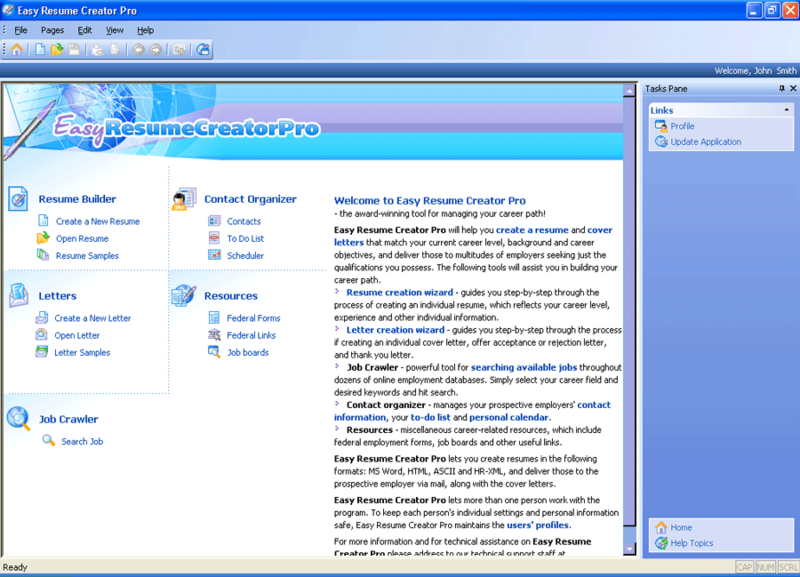 Easy Resume Creator Pro carries links to multiple job boards and employment resources, such as federal forms and employment links. Free updates with templates, samples, job boards and other resources for life—when you register .